Recently I presented at an HTAV conference the ten sorts of searches and resources I look at before I do an open topic Google search. 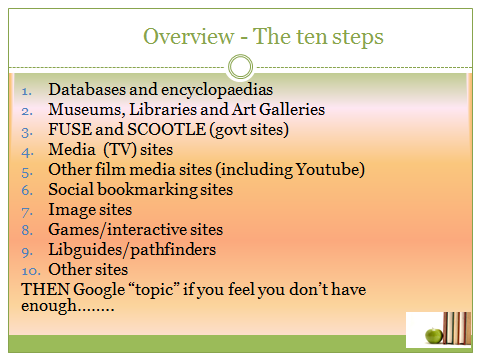 The following research guide is an example of how the ten steps work and as such is not set up in the same way as other guides. It is still a collection of resources but it is not presented in a student friendly way. You need to work out what you like and how you are going to use it. BEFORE you start you need to key words etc. For Easter Island use The Australian Curriculum (including the elaborations) or a Yr. 8 textbook written for the AC. Now to each step – you can read the power point for the reasoning behind the steps. If you don’t have knowledge of which museums etc. hold what sort of collections then just do a Google search of your topic and museum (or art gallery). That is, Google “Easter Island Museum”. However, if you know of a museum that covers your topic start there. I started with Te Papa in Wellington NZ and The Smithsonian (remember Night at the Museum and Dum Dum). 3. FUSE, SCOOTLE and state govt. education portals are useful. You can check these out yourself. and a Google Books Search for Easter Island and get books which have lots of preview pages! Finally, how would I start a unit on Easter Island? • Part of Total Drama World Tour (a kids’ satiric animation). There is an episode that satirises Easter Island and the swim to the outlying island for the birds’ eggs. http://totaldrama.wikia.com/wiki/Rapa_Phooey!